Background: The purpose of this study is to report outcomes of total hip arthroplasty (THA) in patients under the age of 35 years regarding pain and joint function. Materials and Methods: This preliminary analytic-descriptive study was performed in prospective consecutive series of forty-three patients younger than 35 years old who had undergone unilateral THA during a 36-month period. As the primary outcome, the severity of pain using visual analog scale (VAS) of 1–10, and as the secondary outcomes, joint range of motion (ROM) and the Harris Hip Score (HHS) were assessed in the preoperative visit, 1, 6, and 18 months after operation for each patient. Complications were recorded at 6 months and 18 months after surgery. Results: The data of VAS showed the mean severity of pain was significant between preoperation measurements and postoperative assessments (P < 0.001). The means of HHS and hip ROM were also statistically significant before the operation in comparison with postoperative assessments (P < 0.001 for both means). 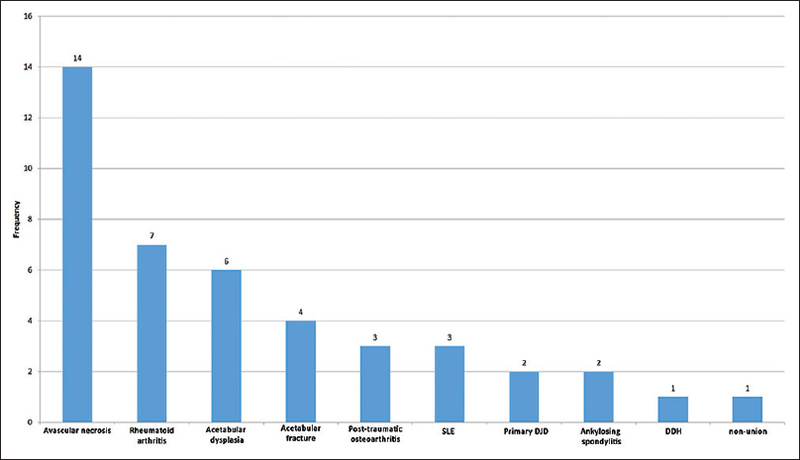 A total of 19 patients had postoperative complications including periprosthetic fracture in two patients, infection in two patients, cup loosening in three patients, limb length discrepancy in 10 patients, and heterotopic ossification in two patients. Seven patients had been readmitted. Conclusion: We believe THA using uncemented prosthesis has a high survivorship with low rate osteolysis in young patients with good bone stock. It is necessary to have longer follow-up to have a better evaluation on outcomes. In recent years, total hip replacement has attracted the attention of many researchers and physicians as the main option to restore joint function in various end-stage degenerative conditions of the hip joint., Severe osteoarthritis (OA) as the most common reason include 70% of conditions resulted in total hip arthroplasty (THA). However, some other conditions such as hip joint trauma and osteonecrosis can cause severe hip dysfunction and resulted in THA. The purpose of this study is to report outcomes of THA in patients under the age of 35 years regarding pain and joint function. Following Ethics Committee and the review board approval (Project No. 395103; Ethics No. IR.MUI.REC.1394.3.103) and obtaining written informed consent from all patients at the beginning, this preliminary analytic-descriptive study was performed in prospective consecutive series of forty-three patients younger than 35 years old who had undergone unilateral THA during a 36-month period (March 2013–2016). Eligible patients were admitted to a university tertiary referral hospital. Nonprobability sampling was performed to select participants. In this therapeutic study and as inclusion criteria, eligible patients were individuals with age under 35, who have indication for unilateral THA. Exclusion criteria consisted of patients with a body mass index >35, abnormal renal function tests (blood creatinine more than 1.5 mg/dl or creatinine clearance <60), abnormal liver function tests, known cases of myofascial pain syndromes and fibromyalgia, spinal and neurological disorders especially radiculopathies and neuropathies, noncontrolled diabetes mellitus, previous major surgery in the same hip joint indicated for THA, those who were candidates for bilateral THA, and also patients who did not show up for the follow-up were also excluded from the study. Other medical disorders which do not effect on pain sensation were treated by other specialists. We used the American College of Rheumatology Preliminary Diagnostic Criteria for Fibromyalgia and Wolfe et al. 's study to rule out suspicious cases of myofascial pain syndromes and fibromyalgia. In our study, there were some disorders of the hip joint considered as indications for THA including arthritis (rheumatoid arthritis [RA], juvenile RA (still disease), ankylosing spondylitis), degenerative joint disease (e.g., hypertrophic OA), osteonecrosis (avascular necrosis), postfracture or dislocation, pyogenic arthritis or osteomyelitis (hematogenous, postoperative), tuberculosis, congenital subluxation or dislocation in hip joint and also hip fusion and pseudarthrosis, previous failed reconstruction, bone tumor involving proximal femur or acetabulum, hereditary disorders such as achondroplasia. An orthopedic resident took a full history including previous activities, past medical problems, allergies, drug history, and psychological problems. In the preoperative visit, electro cardiogram and laboratory tests including hemoglobin, blood sugar, blood group and Rh, blood urea nitrogen, creatinine, alanine aminotransferase and aspartate aminotransferase, urine analysis, and urine culture were performed as well. All surgeries were performed under spinal anesthesia with 10–15 mg of marcaine (bupivacaine) which was done by an anesthesiologist. One gram of intravenous cefazolin (EXIR®, Boroujerd, Iran) was administered 60 min before the surgery. In patients who have a history of hypersensivity reaction to penicillins or cephalosporins, we used 600 milligram of clindamycin (APOTEX ®, Toronto, Ontario, Canada) instead. All operations were performed electively by a single-skilled orthopedic surgeon. All implants were uncemented total hip prosthetics (Zimmer ®, Warsaw, IN, USA). After proper standard sterilization method  and through direct lateral approaches, all acetabular components were inserted using a standard press-fit technique and then adjunct acetabular screws were used to achieve initial mechanical stability of the acetabular component. At the end of the surgery, during soft tissue repairing, a low vacuum extra-articular drain was used which was removed 48 h after surgery. All patients were mobilized on the first day after surgery. For deep venous thrombosis prophylaxis, enoxaparin (Clexane ® Pre-Filled Syringes Sanofi, Seine-Maritime, France) 60 mg SC was administered daily which continued for 14 days. Patients were discharged if they had been mobilized and the wound was dry and clean. Immediately after the operation, the hip was positioned in 15° of abduction using a triangular pillow. All patients remained hospitalized when they were able to get in and out of bed. A similar rehabilitation protocol was performed similarly before surgery, in immediate 24–48 h postoperative period in the hospital, 6 weeks and 6 months after surgery at home, except four patients who have been admitted due to trauma and were not able to begin rehabilitation before surgery. The most rehabilitation practices included strengthening abductors and stretching exercises. Patients were permitted to return work after 6 weeks. The primary outcome of this study was the severity of the pain in the hip joint after surgery which was evaluated by one of the study investigators in the preoperative visit, 1, 6, and 18 months after the surgery. The secondary outcomes were functional parameters including ROM and HHS and complications documented at 1 month, 6 months, and 18 months after the surgery. Descriptive analysis was done to show the means and standard deviations, as well as maximum and minimum of the quantities. The quantitative variables had normal distributions. Sample t-tests were performed to compare quantitative variables between two genders before and after surgery (age, etiology of THA, complication). We used t-paired test and Wilcoxon matched for comparison of VAS, HSS, and ROM before and after surgery. P values were considered significant at amounts lower than 0.05 in the statistical analyses. The statistical analyses were performed using SPSS 23.0 (SPSS Inc, Armonk, NJ, USA) for Windows. The data are presented in mean ± standard deviation. In this study, 54 patients who were candidates for total hip replacement were assessed for inclusion criteria, and forty-three patients became eligible for this study. Four patients did not meet inclusion criteria, and seven patients declined to participate in the study. In addition, no patients were excluded during the course of study. The mean age was 31.2 ± 2.9 years. There were 24 men (55.80%) and 19 women (44.20%) in the study. The most common condition resulted in THA was avascular necrosis (osteonecrosis). [Figure 1] presents the frequency of conditions led to THA. The data of VAS showed the mean severity of pain was 8.8 ± 0.91 while this mean were 1.37 ± 0.6, 0.71 ± 0.33, and 0.71 ± 0.33, respectively, for 1 month, 6 months, and 18 months after surgery. 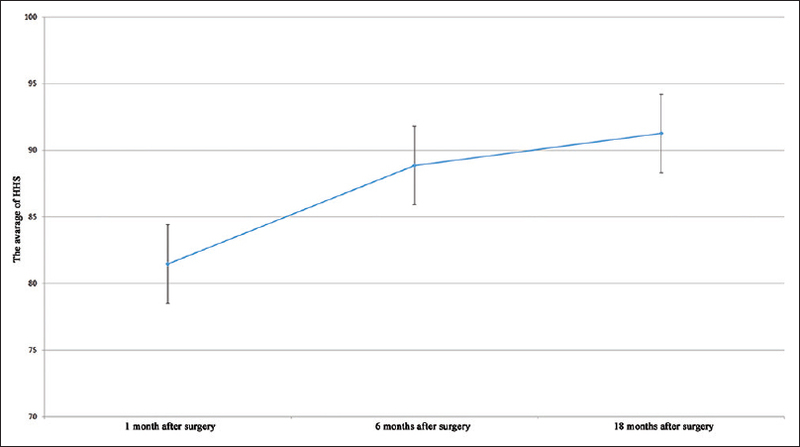 Hence, there was a significant difference in severity of pain before and after surgery (P< 0.001) [Figure 2]. 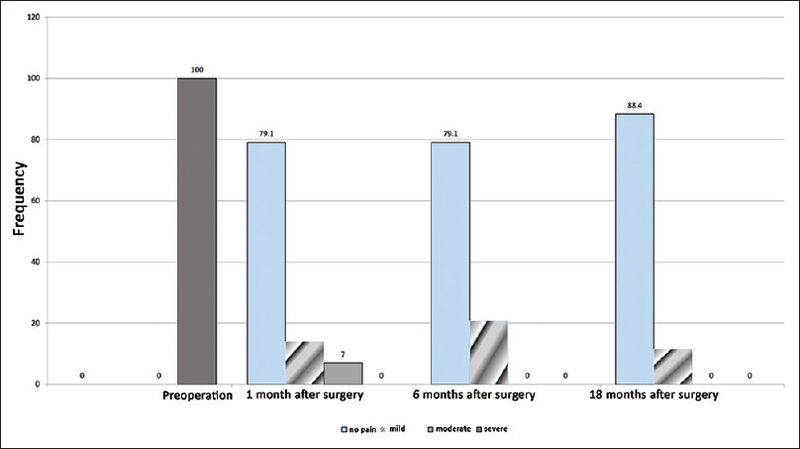 The mean HHS before the operation, 1 month, 6 months, and 18 months after surgery was, respectively, 81.45 ± 6.35, 88.86 ± 5.39, and 91.26 ± 4.75 [Figure 3]. Hence, there was a significant difference in HSS before and after surgery (P< 0.001). In [Table 1], the mean hip ROM has been shown before and at one month, six months, and 18 months after surgery. Repeated analysis of variance of four parameters showed significant difference in hip joint ROM during the treatment period [Table 1]. In this study, nine patients (2/44%) had postoperative complications including periprosthetic fracture in two patients, infection in two patients, cup loosening in three cases, and heterotopic ossification in two case. Limb length discrepancy was also observed in some patients. The average amount of limb length discrepancy was 1.31 ± 0.38 cm (range 1–2 cm). Seven patients (16.3%) had been readmitted. The main finding of our study was the THA effectively decrease the severity of pain and patient satisfaction. The most important finding in our study is that total hip replacement has very low complication and high satisfaction especially among young patients. This study was done in a 36-month period, and patients were followed during 18 months. Against the general candidates for THA who have average age of 65 years, the selection of treatment for young patients especially aged under 30 years sustained from end-stage hip disease is a greater challenge for orthopedic surgeon. The severity of postoperative pain is one of the main factors to assess the satisfaction of patients and quality of life. Nam et al. showed better quality of life in surface hip replacement than THA. It is important for clinicians to have a comprehensive pain assessment in patients undergoing THA. In a study similar to us, Parvizi et al. reported the pain severity is lower in young individuals after primary THA with an uncemented femoral component than preoperative assessment. Some previous studies also showed a good satisfaction after THA in young patients aged under 30 years., In our study, the severity of pain was obviously relieved in short-term evaluation. The most decrease of pain severity was observed in patients who had undergone THA due to avascular necrosis and then RA. The hip joint which is a crucial weight-bearing joint has a central role in the patient's daily activity and this study shows significant improvement in pain reduction and daily function and pain scores. Joint ROM is the most important factor for quality of life after knee or hip replacement. In younger patients, the role of activity as a marker of quality of life is becoming increasingly apparent., HHS is a useful and variable system to assess hip joint function., HHS may be increased after THA especially subsequent to inflammatory arthritis,,, but the effect of THA on HHS is similar between young and old individuals. In the current study, HHS was obviously raised 18 month after operation. Patient satisfaction and a quality of life were made better after THA in patients younger 35 years. The ROM improvement which is obtained through this operation directly correlates with function and patient satisfaction which is measured by HHS. It is difficult to achieve a good ROM especially in young patients, but it is obtained in our study as evidenced by our results. In previous published studies, Juvenile RA was the most common indication for THA in the young population,, while in our study, avascular necrosis of femur head was the most common etiology resulted in THA. Surgical complications is a main challenge for THA. Gerdesmeyer et al. evaluated long-term outcomes of cementless THA and showed the only complication was prosthetic loosening younger than 65 years. Similar results were reported by Delaunay et al. and Kim et al., THA using ceramic prosthesis is associated with high rate of survivorship. Acceptable clinical score after total hip replacement in young patients was revealed with lower implant survival in developmental dysplasia of the hip. Walker et al. also reported a revision rate of 5% at 8.4 years in patient younger than 30 years after THA. Kim et al. revealed well-fixed components without loosening and osteolysis with cementless THA in young patient at their follow-up. In the current study, we observed the most complication was limb length discrepancy against the similar previous studies which showed loosening as the common complication. This operation is not done much in the geriatric population due to low survival rates; in such population and studies show low complication in the younger population, the most common being loosening of the joint. It is necessary for 2-year closed evaluation of loosening aspects and osteolysis., Therefore, we could not measure the exact rate of these two parameters. The main limitation of this study was short-term follow-up of patients. Other limitation was analgesic drugs injection required after operation. On the other hand, systemic diseases might affect the severity of pain or joint ROM. We believe THA using uncemented prosthesis may have a high survivorship with low rate osteolysis in young patients with good bone stock. We recommend that it is necessary to have longer follow-up to have a better evaluation on outcomes. Huo MH, Parvizi J, Bal BS, Mont MA. What's new in total hip arthroplasty. J Bone Joint Surg Am 2009;91:2522-34. Finkbone PR, Severson EP, Cabanela ME, Trousdale RT. Ceramic-on-ceramic total hip arthroplasty in patients younger than 20 years. J Arthroplasty 2012;27:213-9. Siopack JS, Jergesen HE. Total hip arthroplasty. West J Med 1995;162:243-9. Clohisy JC, Oryhon JM, Seyler TM, Wells CW, Liu SS, Callaghan JJ, et al. Function and fixation of total hip arthroplasty in patients 25 years of age or younger. Clin Orthop Relat Res 2010;468:3207-13. Wangen H, Lereim P, Holm I, Gunderson R, Reikerås O. Hip arthroplasty in patients younger than 30 years: Excellent ten to 16-year follow-up results with a HA-coated stem. Int Orthop 2008;32:203-8. Busch VJ, Pouw MH, Laumen AM, van Susante JL, Vervest AM. Long-term outcome of 73 Zweymüller total hip prostheses with a screw cup in patients under 50 years of age. Hip Int 2012;22:292-5. Engesæter IØ, Lehmann T, Laborie LB, Lie SA, Rosendahl K, Engesæter LB. Total hip replacement in young adults with hip dysplasia: Age at diagnosis, previous treatment, quality of life, and validation of diagnoses reported to the Norwegian Arthroplasty Register between 1987 and 2007. Acta Orthop 2011;82:149-54. Nam D, Nunley RM, Berend ME, Berend KR, Lombardi AV, Barrack RL. Residual Symptoms and Function in Young, Active Hip Arthroplasty Patients: Comparable to Normative Controls? J Arthroplasty 2016;31:1492-7. Sanders DP, McKinney FW, Harris WH. Clinical evaluation and cost effectiveness of preoperative laboratory assessment on patients undergoing total hip arthroplasty. Orthopedics 1989;12:1449-53. Wolfe F, Simons DG, Fricton J, Bennett RM, Goldenberg DL, Gerwin R, et al. The fibromyalgia and myofascial pain syndromes: A preliminary study of tender points and trigger points in persons with fibromyalgia, myofascial pain syndrome and no disease. J Rheumatol 1992;19:944-51. Olsen I, Snorrason F, Lingaas E. Should patients with hip joint prosthesis receive antibiotic prophylaxis before dental treatment? J Oral Microbiol 2010;30:2. Canale TS, Beaty JH. Arthroplasty of the hip. Campbell's Operative Orthopaedics. 12th ed. Canada: Elsevier; 2013. p. 158-310. Gililland JM, Anderson LA, Erickson J, Pelt CE, Peters CL. Mean 5-year clinical and radiographic outcomes of cementless total hip arthroplasty in patients under the age of 30. Biomed Res Int 2013;2013:649506. Schmitz MW, Busch VJ, Gardeniers JW, Hendriks JC, Veth RP, Schreurs BW. Long-term results of cemented total hip arthroplasty in patients younger than 30 years and the outcome of subsequent revisions. BMC Musculoskelet Disord 2013; 14:37. Harris WH. Traumatic arthritis of the hip after dislocation and acetabular fractures: Treatment by mold arthroplasty. An end-result study using a new method of result evaluation. J Bone Joint Surg Am 1969; 51:737-55. Delaunay CP, Putman S, Puliéro B, Bégin M, Migaud H, Bonnomet F. Cementless total hip arthroplasty with metasul bearings provides good results in active young patients: A concise followup. Clin Orthop Relat Res 2016;474:2126-33. Jauregui JJ, Lerner AL, Mistry JB, Chughtai M, Elmallah RK, Mont MA. A comprehensive assessment of various outcome scores to evaluate total hip arthroplasties. Surg Technol Int 2015;27:251-6. Parvizi J, Keisu KS, Hozack WJ, Sharkey PF, Rothman RH. Primary total hip arthroplasty with an uncemented femoral component: A long-term study of the Taperloc stem. J Arthroplasty 2004;19:151-6. Pakos EE, Paschos NK, Xenakis TA. Long Term Outcomes of Total Hip Arthroplasty in Young Patients under 30. Arch Bone Jt Surg 2014;2:157-62. Malcolm TL, Szubski CR, Nowacki AS, Klika AK, Iannotti JP, Barsoum WK. Activity levels and functional outcomes of young patients undergoing total hip arthroplasty. Orthopedics 2014;37:e983-92. Lieberman JR, Hsu WK. Prevention of venous thromboembolic disease after total hip and knee arthroplasty. J Bone Joint Surg Am 2005;87:2097-112. Walker RP, Gee M, Wong F, Shah Z, George M, Bankes MJ, et al. Functional outcomes of total hip arthroplasty in patients aged 30 years or less: A systematic review and meta-analysis. Hip Int 2016;26:424-31. Scott RD. Total hip and knee arthroplasty in juvenile rheumatoid arthritis. Clin Orthop Relat Res 1990;259:83-91. Bilsel N, Gökçe A, Kesmezacar H, Mumcuoglu E, Ozdogan H. Long-term results of total hip arthroplasty in patients with juvenile rheumatoid arthritis. Acta Orthop Traumatol Turc 2008;42:119-24. Gerdesmeyer L, Al Muderis M, Gollwitzer H, Harrasser N, Stukenberg M, Clifford MA, et al. 19 years outcome after cementless total hip arthroplasty with spongy metal structured implants in patients younger than 65 years. BMC Musculoskelet Disord 2016;17:429. Kim YH, Park JW, Kim JS. Long-Term Results of Third-Generation Ceramic-on-Ceramic Bearing Cementless Total Hip Arthroplasty in Young Patients. J Arthroplasty 2016;31:2520-2524. Tsukanaka M, Halvorsen V, Nordsletten L, EngesæTer IØ, EngesæTer LB, Marie Fenstad A, et al. Implant survival and radiographic outcome of total hip replacement in patients less than 20 years old. Acta Orthop 2016;87:479-84.